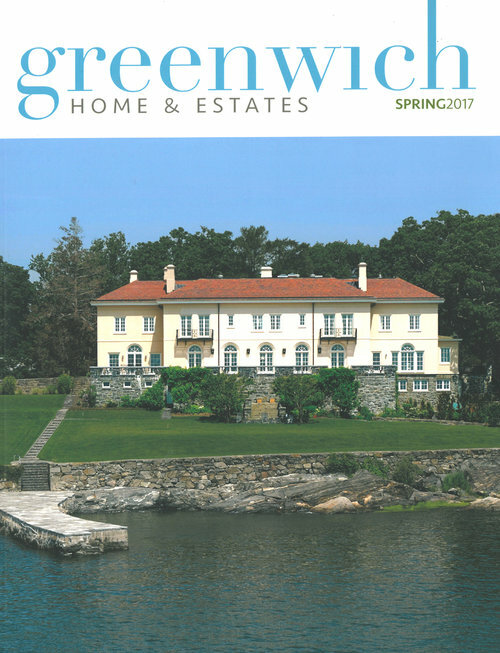 Greenwich home & estates magazine interviews Brian MacDonald, president of award winning builder Davenport Contracting for their Spring, 2017 issue. BOOK: Pillars of the Earth by Ken Follet, and a book about the life of Elon Musk. TRAVEL: We love to travel. Our favorite trips have been to see the natural beauty of Iceland and the South Island of New Zealand. Most of all, we enjoy spending time with our children and grandchildren on Nantucket in the summers, and Big Sky, Montana in the winter. LIFE LESSON: Life is all about the journey and less about the destination. GH&E: How did you come to live in Greenwich? Brian: I moved to Greenwich in 1975, having come from the Midwest. After receiving my MBA at Columbia, I worked for IBM for about fifteen years. My wife and I started out in Cos Cob and as our family grew, we moved to Riverside, where we’ve been since 1983. Brian: Yes, it's interesting that my introduction to Davenport would be as a client when we were renovating our current home, an old Tudor in Riverside, over 25 years ago. We had the good fortune of selecting Rick Koch as our builder. Even though Davenport was small back then, the firm's reputation was top notch. At the time I was still in the corporate world, but ready for a change. We both decided that if we worked together, we could create something bigger and better than what we could do individually. We joined forces, becoming equal partners in a new Davenport Contracting, Inc.
GH&E: What did you bring to the new partnership? 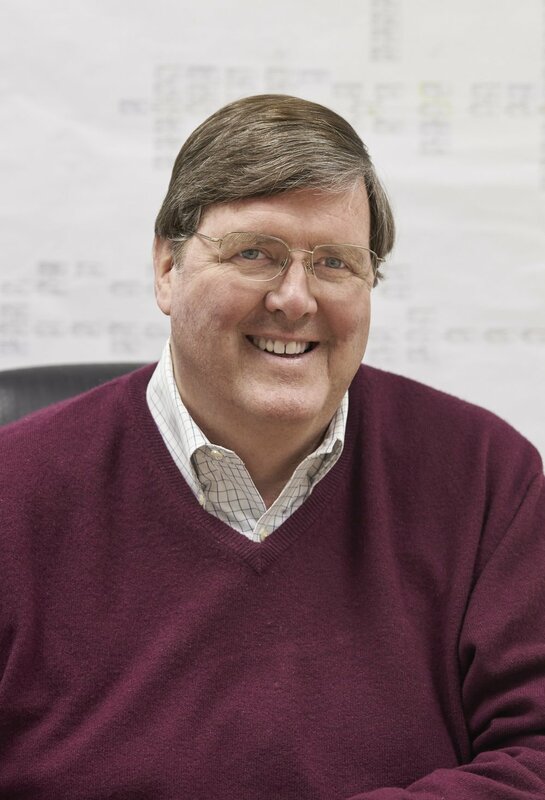 Brian: From the beginning, Rick and I focused on maintaining the high quality for which Davenport was known, while continuously working to improve and refine our process, which was my specialty. We have been fortunate to hire talented employees as managers and tradespeople to complement and complete our goals. Each member of our staff shares our stated objective of “delighting our customers”. Our success in building new homes and restoring existing homes provided us with the opportunity to expand into another, much needed niche market with Davenport Home, which takes care of a multitude of smaller, but no less significant, building and home maintenance projects. Sadly, in 2016 we lost Rick to a hard fought battle with cancer. We all miss him, and his absence is felt on a daily basis. However, with the help and dedication of our management team and our talented employees, we have been able to maintain our focus and continue to build new projects. Rick’s wife and son remain invaluable members of our team. In addition, my son and son-in-law have come on board. I feel incredibly fortunate that for over 20+ years we have not only had the opportunity to work with many significant architects, but also the pleasure of helping to make our client’s dreams become a reality. GHE: Share with us the house that you have built that you are most proud of. What made this project so special? Brian: Davenport has been so lucky to have been involved with many special clients and talented architects building very special and unique projects over the years. We recently completed a new limestone home with many specially hand-carved details. It has all the amenities of a new home while projecting that wonderful classic look of time gone by. We are currently adding on to and restoring a wonderful historic old Tudor stone home filled with leaded and stain glass windows. It is teeming with old world character. We have also been involved with several spectacular modern homes including one without any right angles and another identified as a “Glass Barn”. GH&E: Please tell us about any new trends in home construction that you find interesting. Brian: Davenport has been helping our customers’ select energy saving projects for the last several years. We have been installing geothermal systems for some time. In addition, we have installed co-generation systems that use natural gas to create electric power used in the home and any remainder can be sold back to the grid. The other by-product is that any heat generated can be used as additional heat in the home for the winter and to supplement the heat for a swimming pool in the summer. These types of projects, along with other energy saving practices such as using LED lighting, new insulation techniques, and a greater use of thermal windows are all part of the trend to reduce the energy footprint of our new homes. GH&E: Tell us about a “wow” feature that you’re currently building into a home. Please elaborate on how the idea came about. Were there any challenges in implementation? Brian: The “WOW” factor is a relative term when you have the good fortune to help build a world class theater that has been recognized by industry experts as a best-in-class viewing and auditory experience. By teaming with a special technical theater company for the West Coast we were able to deliver incredible results. When building something this special, our team needed to be able to consistently adapt to the demanding requirements of the owner and the theater specialists. 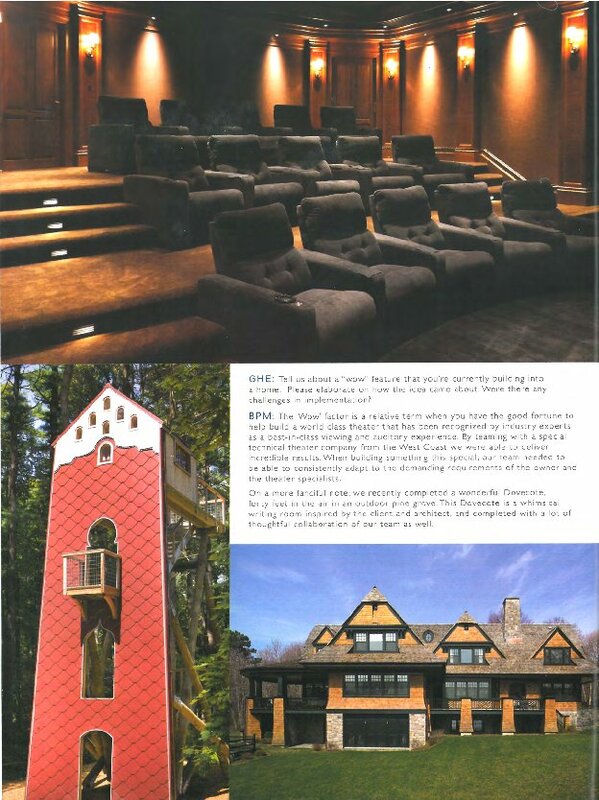 On a more fanciful note, we recently completed a wonderful Dovecote, forty feet in the air in an outdoor pine grove. This Dovecote is a whimsical writing room inspired by the client and architect, completed with a lot of thoughtful collaboration on the part of our team as well.